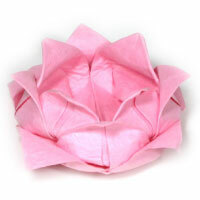 You can learn to make various kinds of origami lotus flowers here. 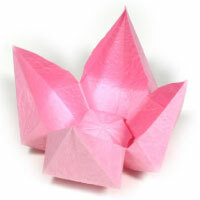 This simple lotus is a four-petals version of origami paper lotus and it is very simple to make. 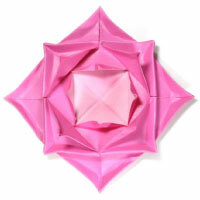 This traditional fractal lotus flower is a sixteen-petals version of origami lotus. The essential folding technique involved with this model is cushion-fold which will be applied three times. The original traditional model is free from applying rabbit ear-fold on each petal. 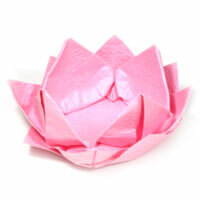 This easy origami lotus flower is easier to make compare to the traditional lotus. 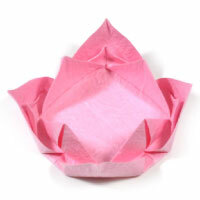 It is a twelve-petals version of lotus. One special folding technique involved with this model is a curved valley-fold. This new lotus flower is a modified version of the traditional lotus. It is a twelve-petals version of lotus. The essential folding technique involved with this model is cushion-fold which will be applied for three times.